No more room to collect? Christie’s has the solution. I’ve often met collectors who told me they no longer have any room for new purchases. Well if you’re from the greater New York area, you no longer have an excuse. Christie’s New York has signed a lease on a huge 235,000 sq. ft. warehouse and you can rent space there. 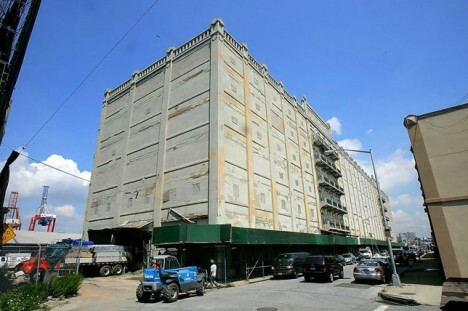 It will be in the up-and-coming Red Hook section of Brooklyn, which already boasts major IKEA and Fairway Market stores. The building is a mess at the moment, but after Christie’s gets finished with it, it will be a state-of-the-art, high security, climate-controlled, storage facility. It will be equipped with infrared video cameras, biometric readers, and detectors for motion, smoke, heat and water. Nice, since it’s likely that the value of the art stored there will exceed the value of the building. Christie’s already has offered this service in London for many years. Now New York has been added, with additional plans for the same service in Singapore. Richard Wright had quite an eye for the best and that included very fine examples of Martin Brothers stoneware. 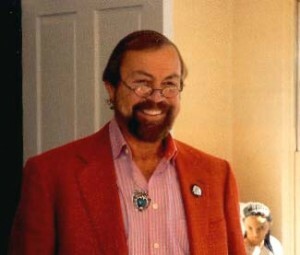 The auction results of that good eye showed at the Skinner auction of his collection on October 24, 2009. The Martin Brothers were well represented in his collection. There were vases, tobacco humidors, face jugs and a spoon warmer, that ranged from the early “normal” items to the very desirable and collectible “grotesque” items. The standard early ceramics don’t usually command much interest because collectors have zeroed in on the grotesque, but that didn’t stop a determined crowd and phone bidders. A large stoneware vase with realistic lily flowers carried a low pre-sale estimate of $4-600 and sold for $4,444, including the buyer’s premium. Other early standard vases also did well, but the real fireworks started when the grotesque items came up for sale. 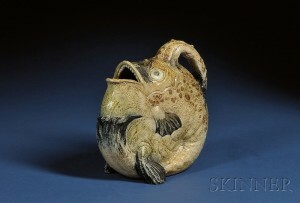 The first important item was lot #100, a large spoon warmer in the form of a fish. It soared to an incredible $53,325, against a pre-sale estimate of $3-5,000. That set the stage for the other important Martin Brothers items, two tobacco humidors in the form of birds. 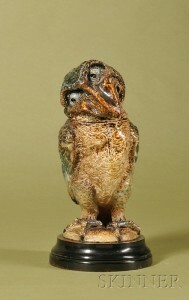 Martin Brothers birds are the best known and most sought after of all Martin items and these two did not disappoint. 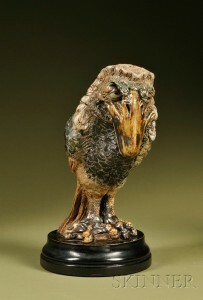 The first was lot #151, a brooding bird, 10½” tall. Collectors pay the most for the best personality and this bird was good. The pre-sale estimate was $12-18,000. It brought an astounding $82,950, including buyer’s premium. The next lot was larger and in my opinion, more interesting, but the buying public disagreed. It still sold very well, but not quite as well as #151. The final price was $59,250, against a pre-sale estimate of $12-18,000. The fireworks continued with very strong results for vases, face jugs, and an unusual Eskimo jug. Only the most determined of collectors went home with any of the Martin Brothers items — it was quite a showing. 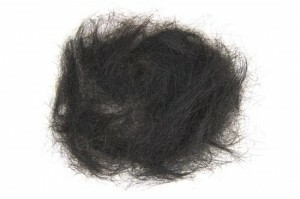 On October 24, 2009, Skinner, Inc. sold part II of the Richard Wright Collection. 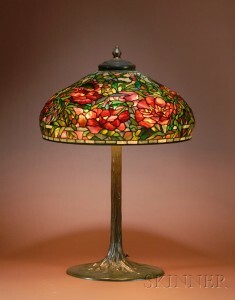 Overall, the sale was a barnburner, but today I’ll only discuss the Tiffany Studios lamps and glass. Yesterday, I reviewed a few of the results and tomorrow, I’ll discuss the Martin Brother ceramics and Zsolnay pottery results. Richard didn’t collect too many Tiffany lamps, but the ones he did were special. The most important lamp of his collection was a 22″ elaborate Peony. It was estimated at $300,000 – $500,000, one of the more aggressive estimates in the sale. 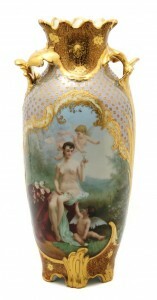 The lamp sold within the estimate, for $435,000, including the buyer’s premium. The photos in the catalog and on their website do not do the lamp justice, as it was more colorful and beautiful in person. 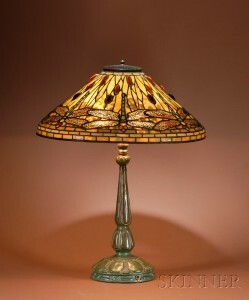 A 20″ Dragonfly lamp on a mock Turtleback base was estimated for $25-35,000 and quadrupled the high estimate for a final price of $148,125, including the buyer’s premium. 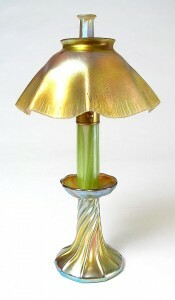 Lot #291 was a rare Daffodil Jonquil table lamp. It sold to a dealer for $112,575, against a pre-sale estimate of $30-50,000. A Tiffany 10-light lily did not fare quite as well, as it was sold with one reproduction shade and one cracked shade. It was estimated for $7-9,000 and sold for $22,515. 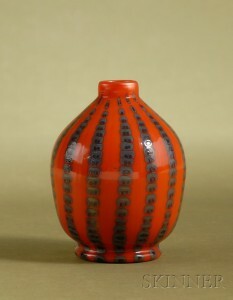 A small, but rare and interesting Tiffany Favrile vase, deep orange with a zipper decoration, was estimated for a silly low price of $4-600. It sold for $10,665, in the range one would expect for a vase of this quality. It was a good day for Tiffany Studios items at auction, but that was to be expected. The items were high quality, fresh-to-the-market, estimated low, and sold into a market where superior Tiffany items have been strong for quite some time. Richard Wright died on March 1, 2009 at age 62. He was best known as the expert doll appraiser for the Antiques Roadshow. He was also the owner of Wright Antiques & Dolls, in Birchrunville, Pennsylvania. I used to see him regularly when we both exhibited at the Atlantique City show. Skinner Inc. was the lucky auction house to sell his collection. They divided it into two parts, with the dolls being sold first on October 10, 2009 and the rest of his eclectic collection on October 24, 2009, with spectacular results. I’ll only cover the second session, which was so diverse and so exciting that I’ll divide my coverage into three parts. Skinner’s knows how to market a sale. They let the public know that everything was there to sell by putting estimates that were so low, that everyone thought they were in the game. There is nothing better for a stellar auction than high quality, fresh-to-the-market items at low or no reserves. Stuart Whitehurst was the supervisor in charge. He and his staff did a great job and the results show it. 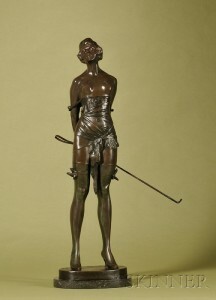 A large Bruno Zach bronze entitled “The Riding Crop”, 33½” tall, was estimated for $12-15,000. It sold for $94,800, including buyer’s premium. Richard had a few pieces of Art Nouveau furniture in his collection and the auction results for them were fantastic. 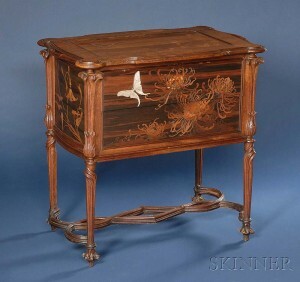 A Gallé two-drawer side table with mother-of-pearl butterfly inlays was estimated at $6-8,000. It brought an astounding $136,275, including buyer’s premium. A Gallé marquetry hall tree for coats and umbrellas, was estimated for $3-4,000 and sold for $31,995, including the buyer’s premium. The results for Tiffany glass and lamps, Martin Brothers ceramics and Zsolnay pottery were equally tremendous. Tomorrow I’ll cover the Tiffany and the next day the Martin Brothers and Zsolnay. What a difference a city makes. After two very good shows in Chicago, I was cautiously optimistic about my show in Denver. This was my second time in Denver after having exhibited there this past July. That show went well enough for me to want to try Denver a second time. I can now report that Denver is not Chicago. Big surprise. It’s not for lack of attendance. There were quite a few people at the show, but there was a distinct lack of sophistication. Most of the people strolling by had no concept of what they were viewing. With a paucity of educated questions, it was highly unlikely that I could make a sale. Unfortunately that was the case. Day 1. One small sale. Not only was business poor, but I had to raise my voice to an elderly gentleman who was opening my showcase without permission (he was quite hard of hearing). As many of you know, that is verboten in my booth (and most everybody else’s too). Day 2. One book sold. A rotten day. To make things worse, I was busy all day bidding on the telephone at the Skinner auction of the Richard Wright collection. Prices were on fire in Boston, with little business in Denver. It was an interesting juxtaposition. Day 3. One book sold. A lady asked me the price of a Tiffany Dragonfly lamp “just for fun”. When I told her the price, she started laughing hysterically. Lady, I’m having a tough day. Go away! Later a good client called to tell me she wasn’t feeling well and couldn’t attend the show, nor could she make up her mind yet about a prospective purchase. Some days it doesn’t pay to get out of bed. I was thinking of exhibiting in Denver again in March, 2010, but that won’t be the case. I will give the city another shot in July, 2010, on the way out west to my shows in Redondo Beach and Pasadena. My plan will be to exhibit there every July if the next one works for me. If not, goodbye Denver. It’s a nice show, so I hope it works out. This is my second time exhibiting at the Denver Antiques Show. I came back because the July show went fairly well. What was best for me was that I was reaching new clients that I had never seen nor sold to before. The first thing that I noticed during setup is that the show is bigger than the summer show. Apparently the summer show is the smallest of the three shows per year. This time the side room is full of dealers. The second thing I noticed is that the quality of the exhibits is surprisingly good — better than I thought it would be. I’m not sure why I ignored Denver for all these years, but I hope that business is good enough for me to want to come back regularly. I heard a horror story from one of the dealers about the last March show. Apparently the snow and ice were so bad that when the dealers left the show, they were confronted by really dangerous driving conditions. It’s certainly a consideration should I decide to exhibit here next March. The weather in Denver can be fickle. I’ve been told that it may snow heavily, but that it will melt shortly after. I’ll report on Monday about the results of the show. I’m cautiously optimistic because I see business getting better. Maybe it was just better in Chicago. We’ll see. 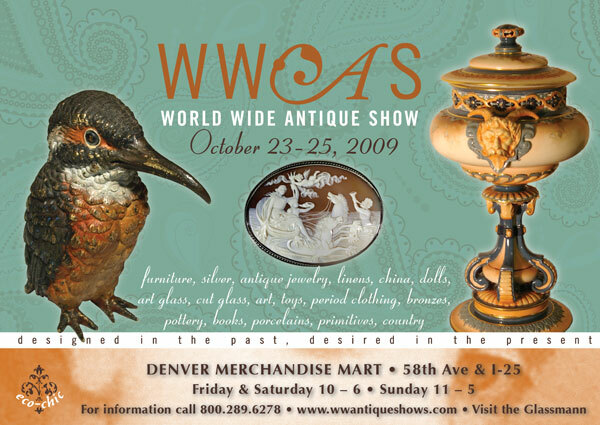 This weekend, October 23-25, I’ll be exhibiting at the Denver Antiques Show at the Denver Merchandise Mart. This past summer was the first time I exhibited there and did well enough to return. It fit well into my schedule on my way out to exhibit in California at the Redondo Beach Antiques Fair and the Pasadena Antiques Show. Unfortunately, sales at San Francisco shows slowed to the point where it wasn’t worth the risk of exhibiting there, so I added Denver and subtracted San Francisco. I find it interesting that most buyers at shows don’t feel any personal responsibility for the success or failure of any particular show. It’s always the “other guy”. Well, folks, that’s not true. If you attend a show and rarely purchase anything, or don’t attend a show that you used to attend, you are responsible. Paying an admission fee entitles you to attend and helps the show promoter, but not the dealers. If a dealer doesn’t sell enough to cover his costs and make a day’s wages, he probably won’t return. That doesn’t count the considerable time and effort expended to exhibit. If some dealers don’t return, the next show looks weak and the public is disappointed. 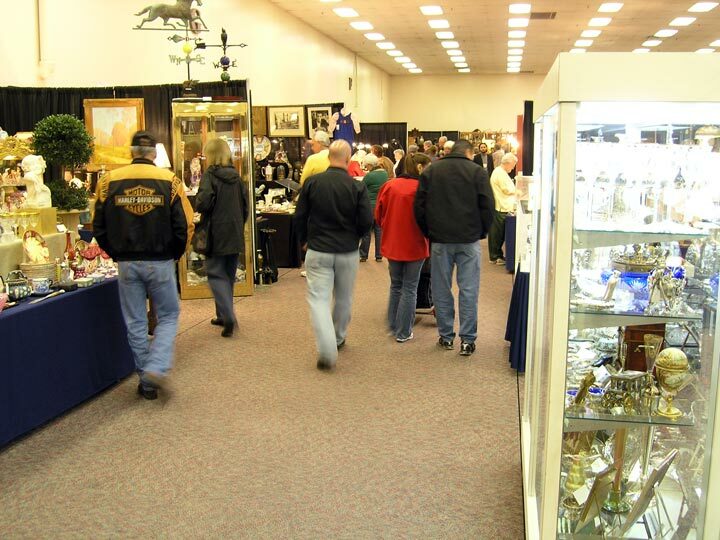 As a result, the next show has fewer attendees and more dealers do poorly. For some shows, it’s a death spiral that goes round and round until the show’s demise (Atlantique City). I’ve seen it happen too many times. A show is like living organisms living symbiotically. When the show is healthy, everyone benefits – promoters, dealers and attendees alike. 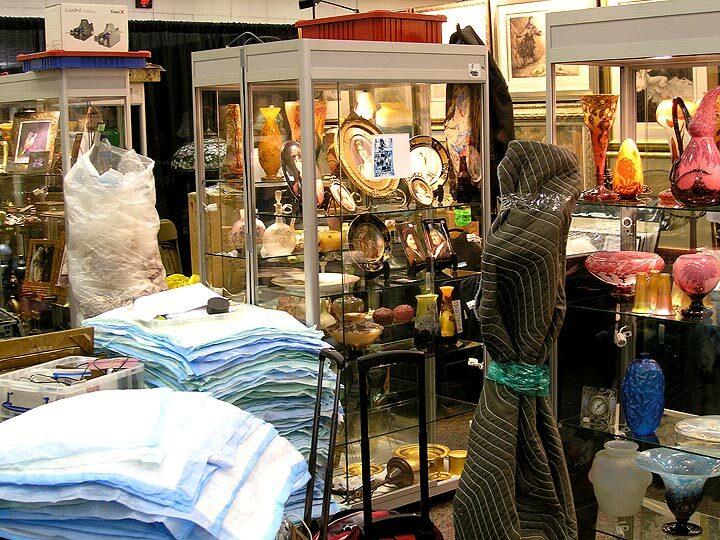 I just added a show to my schedule that I hope you will attend – the Morristown Armory Antiques Show in Morristown, NJ, the weekend of November 7-8. I’ve exhibited there before to wildly mixed results. I had one of the best show days ever at that show and also one of the poorest shows, so I stopped exhibiting there. After my excellent shows in the greater Chicago area, I thought that it might be time to try the show again. Allison Kohler, the show promoter, told me that she has a huge waiting list of dealers who want to exhibit there, but that she is completely sold out. She even turned the front entrance into an additional booth to accommodate the demand. It should be one of the best shows ever at the Armory. I’ll be bringing my best items, so try to make the time and visit. On October 18, Leslie Hindman Auctioneers held an auction of Elvis Presley memorabilia from the collection of Gary Pepper, who was the president of the Tankers Fan Club, for Elvis fans. The top lot of the sale was a cotton shirt with the initials “E.P.” Even with a disclaimer by the auction house that this may not be the exact shirt that Elvis had worn in the accompanying photo, the lot soared to $62,800, against a pre-sale estimate of $2-4,000. Wow! That’s a lot of dough for a shirt that MAYBE Elvis had worn. Collectibles about Elvis, but not personally his, did well, but not as well as the personal items. For example, a large collection of 1950s publicity photographs of Elvis sold for $610 against a pre-sale estimate of $2-400. A group of ticket stubs from Elvis Presley concerts estimated at $20-40 sold for $427. Click on the following link to view the entire results of the auction. The Gary Pepper Collection of Elvis Presley Memorabilia. The Atlantique City show folded in August, after many successful years. When it first started in 1986, two lines formed on the boardwalk, one north and one south, up to a mile long. The show was wildly successful at first, but over the years, the show started to lose its luster. In recent years it started a downward spiral that the promoters could not stop. Fast forward. The show is being replaced by a brand new show, promoted by Allison Kohler, the owner of JMK Shows. 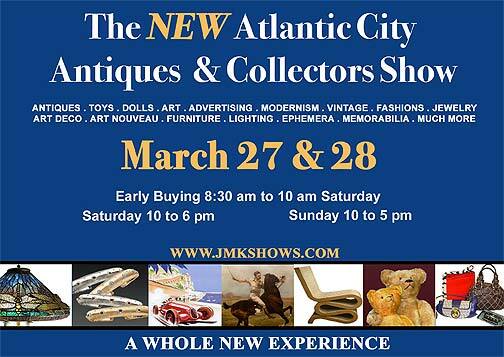 JMK Shows promotes several New Jersey shows, including Birchwood Manor in Parsippany and the Morristown Armory Antique Show, as well as several shows in Sarasota, Florida. 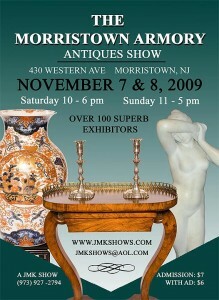 Allison told me that the show will be completely different, with sections corresponding to the type of antiques sold. For instance, there won’t be a doll or toy dealer next to a fine antiques dealer. The show will have a walled section with the best quality dealers. According to Allison “You only have one opportunity to make a first impression” and therefore she intends to pull out all the stops to return the show back to the success that it once was. Here’s wishing her the best of luck. I just finished my third show in the greater Chicago area in six weeks, with sincere reservations beforehand. After all, how many times can you exhibit in the same city within a reasonably short period of time? Well, the answer is THREE! The show went very well and I’m both surprised and pleased. What happened is that my clients who couldn’t attend the previous two shows found the time to attend this one. Sales were made to existing clients (thank you very much!) and also several new ones. That’s as good as it gets. I always value sales to my loyal clients, but it’s important to make sales to new ones too. When I have a show where I make very few, but good sales, I feel lucky. I don’t want to feel lucky. I want business to be good and when it’s spread across a larger base of clients, it means that business is good. Guess what? Business is good! There was interest across the board. Sales were made in Tiffany, Daum, Galle, Rookwood, Newcomb College, Marblehead, Royal Vienna, and bronze and ivory, to name a few. That’s the way it’s supposed to be! If the stock market is a leading indicator of the end of recession, let me add that the antiques business also seems to be a leading indicator. The economy is getting better and it’s starting to show. After a wonderful show at the Chicago Merchandise Mart a couple of weeks ago, it was very gratifying to see that it wasn’t a fluke.